This time there are a few new colors and style available. Someone asked about long sleeves last month, so I’ve included one of those (in black). There also were several inquiries about fitted women’s shirts, and so there are several options available for this month. 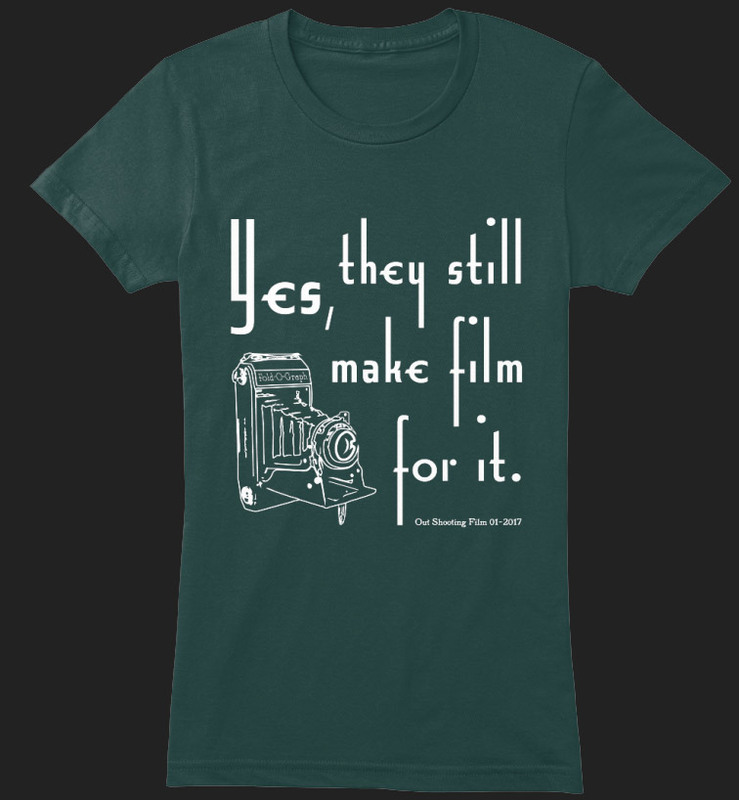 Out Shooting Film 01-2017 forest-green women’s fitted T-shirt. All three styles (men’s short sleeve, men’s long-sleeve and women’s fitted short-sleeve) are premium American Apparel 100% cotton T-shirts. Men’s short-sleeve are available in black, maroon, navy, royal blue, olive, and two shades of grey. Sizes from XS up to 3X. $19.99 each. Men’s long-sleeve are available in black only. Sizes from S up to 2X. $24.99 each. Women’s fitted short-sleeve are available in Kelly and forest green, fuchsia, coral, black, and two shades of grey. Sizes from S up to 2X. $21.99 each. There is a separate charge for shipping, but there is a shipping discount for multiple items. Last month’s shirts came out looking fantastic and have already held up to several washings without losing any of that brand-new look-and-feel, so I went with the same manufacturer. As with the previous shirt, I’ve done my best to keep prices as low as possible. 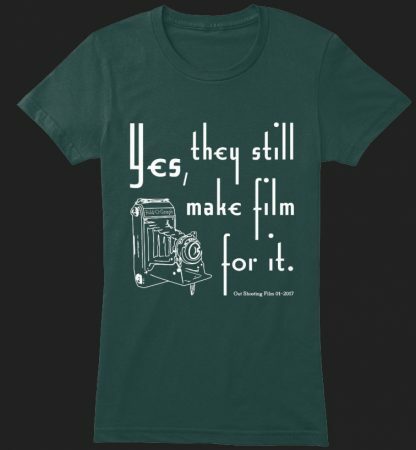 There has to be a little in it for Teespring or the won’t handle the printing and shipping, and I’m hoping, once more, to keep enough myself to buy a little film. The December 2016 shirt netted me $27 and change, which I’m quite happy with! This month’s image is inspired by a Zeiss Ikon Nettar 512/2 folding 120 camera. Please join me in sending a big hat-tip to Lance King for supplying the base image of his Nettar. Help me out and buy a shirt, or wait to see what next month will bring. Above all, please comment below with your feedback so I can improve the series moving forward. » Get your January 2017 shirt on Teespring.com today!